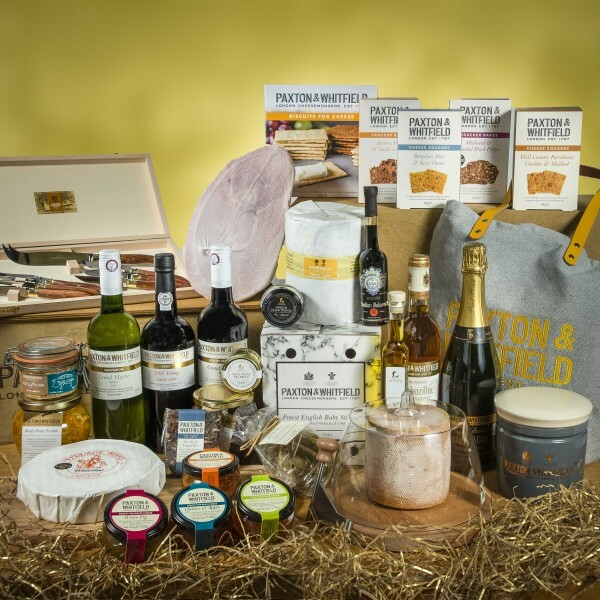 The ultimate hamper of pure indulgence including a selection of the finest cheeses, accompaniments and accessories. A truly remarkable selection of cheese and fine food. Comprising more than 30 items, including some of the season’s the most perfect cheeses alongside specially selected wines and port. You will also find a fabulous choice of mouth-watering preserves, a half Wiltshire ham and a host of truffle products to compliment. With cheese knives and serving platters included, you’ll be all set to enjoy many cheese feasts with this beautiful cheese hamper. This perspex lid is a cover for our cheese curler which can be searched for on code 430. The cover has a diameter of 20cm, and is approximately 15cm high. A stylish reusable bag made from 100% recycled 12oz grey cotton. It features yellow leather handles with a matching yellow lining and the Paxton & Whitfield logo embroidered on one side. This bag is: W:32.5cm, H:40cm.